Hi, my name’s Trevor Bailey and I’ve been involved with SLS Free products since 2010. 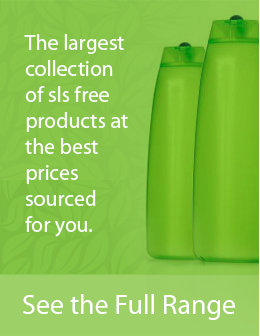 What started as a simple blog post raising awareness of SLS Free products has grown into an online store and dedicated site that receives thousands of visitors every week. Our readers come to learn more about the effects of Sodium Lauryl Sulfate and Sodium Laureth Sulfate and help make an informed choice when it comes to hair and skin care products. As someone who experienced irritation of the scalp and dandruff for many years, my own experience when switching to an SLS Free brand was almost immediate. I’ve since recommended SLS Free shampoo to many people who have seen similar results. It’s one thing to cause irritation of the skin and gums, which can be painful and depressing enough on it’s own, trust me I’m well aware. What really alarms many people about SLS are the effects of the chemical over the long term or as residual levels build up over time in our bloodstream. Before I say too much I want to point out I’m just a regular Joe, and certainly not a doctor or scientist. I provide opinions not facts but the opinions are well researched and completely unbiased. While I sell SLS Free products here on the site my feelings on SLS being any more than a skin irritant have been known to fluctuate quite a bit. The American Cancer Council has dismissed claims that Sodium Lauryl Sulfate causes cancer and at this time there is no evidence that Sodium Lauryl Sulfate is carcinogenic. In fact much of the misinformation about SLS is the result of unethical marketing and rumor, particularly an email that circulated which claimed to be from the University of Pennsylvania which stated SLS did cause Cancer, this was later denied by the university and considered a hoax. However it must be said nobody can give a definitive answer one way or another over residual levels of the chemical over time and the impact this can have on our health as testing has only been conducted on the chemical itself not the actual skin and hair care products it contains over time. Rumor has it levels of SLS can be found to range anywhere from 1% to 50% in some hair care products and at this point in time the United States has no mandatory testing requirement. Many people have written intelligent arguments on both sides. There are valid concerns about Sodium Lauryl Sulfate and Sodium Laureth Sulfate from esteemed scientists such as David Suzuki which are difficult to ignore. It would seem by and large the manufacturing process is extremely important in relation to the risk it poses on our health, which leaves us to trust the large cosmetic companies are doing the right thing by us. There are however a number of undisputed facts surrounding SLS. The Food and Drug Administration have made recommendations regarding Sodium Laureth Sulfate. Traces of 1,4-Dioxane, most commonly referred to as Dioxane have been found in SLES. Dioxane is a suspected Carcinogen as classified by the Environmental Protection Agency, although testing has only been limited. As a result the Food and Drug Administration recommend removing 1,4 Dioxane but this is not monitored nor is it a requirement. The issue of skin irritation isn’t disputed however. Many people have experienced relief when it comes to skin conditions such as Dermatitis and Eczema simply as a result of switching to an SLS Free alternative. The same can be said for canker sore sufferers. Canker sores can be terribly painful and while making the switch to an SLS Free toothpaste certainly wont help everyone, it has worked wonders for many. I recommend making up your own mind about SLS. You will find plenty of information on the site to help you form an opinion one way or the other. I believe the products we sell can provide relief for those with existing skin and gum conditions and recommend those experiencing this type of problem to give them a try for at least three weeks. When it comes to concerns over other health implications we ask you make up your own mind. As new information comes to light we will be sharing it with you and at all times will offer a completely unbiased opinion. As information comes to hand I will be writing about it here at slsfree.net and I really hope to get a conversation going with you the reader. If you would like to participate on SLSFree.net simply drop me a line at info (at) slsfree.net. I look forward to hearing from you.